LIMA (Reuters) - Peru's Prime Minister Cesar Villanueva has stepped down, the government said on Friday, amid calls for President Martin Vizcarra to shake up his government and revive falling approval ratings. Villanueva, the prime minister for the past year, handed in his letter of resignation to Vizcarra, the president's office said in a statement, confirming media reports earlier on Friday. The statement did not say the resignation was accepted but said Vizcarra thanked Villanueva for his services. A new prime minister has not yet been chosen but two government sources who asked not to be named told Reuters that Justice Minister Vicente Zeballos was under consideration for the position. Vizcarra will likely make several cabinet changes to revamp his team and shore up slipping support, the sources said. A survey by Datum Internacional published in local daily Peru 21 on Thursday found Vizcarra's approval rating dropped seven percentage points from February to 56 percent. 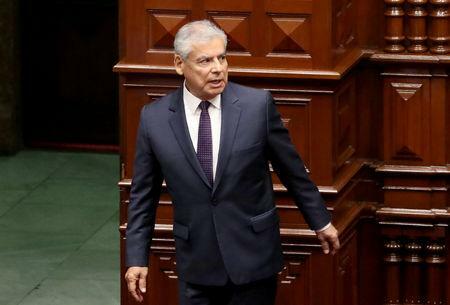 Presidents in Peru often reshuffle the cabinet when their approval ratings fall, though all recent presidents have ended their terms widely unpopular. Vizcarra's approval rating rose to a high of 66 percent in January after he confronted the opposition-ruled Congress and pushed for passage of measures aimed at fighting corruption which had passed easily in a national referendum in December. In the past week he has faced criticism that he has not done enough to tackle other problems, and for travelling to Spain and Portugal on a state visit instead of visiting regions affected by flooding and landslides. A former vice president, Vizcarra took office a year ago to replace Pedro Pablo Kuczynski, who resigned after a graft scandal. Peru is the world's No.2 copper producer and one of Latin America's most stable economies.